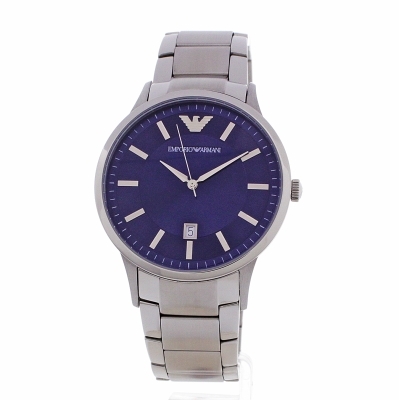 A striking watch design from Emporio Armani. This model is made from stainless steel and has a large round case. The model features a handsome blue dial with date function, silver baton hour markers and silver hands. It fastens with a silver metal bracelet and is powered by a quality quartz movement. The watch has a good solid feel and attractive blue watch face. Very tasteful design look and looks good on the wrist, although, the face is large the watch is very light to wear. Very pleased with the watch! Was beautifully gift wrapped and presented! Was a gift for my partner and he was thrilled. Picked it up from my local Goldsmith’s the next day with no problems, and they were very helpful. Very reasonable price for a beautiful watch! An absolutely beautiful watch. Works a treat. Very stylish and easy to work. fantastic watch, very please,however, I had provided a wrist size so that the links could be taken out before despatch bu this wasn t done, meaning I had an extra journey to find a Goldsmiths. Lovely good quality watch. Sturdy fastening easy to open and close. Looks great easy to wear as a dress watch or an everyday watch. Makes a great 21st present. Very pleased with my purchase. As always delivery was prompt and the quality excellent. I’ve used this site a number of times and will continue to do so. I highly recommend this site. Despite the quality of the gift - which was phenomenal. The overall service and support was even better. I will definitely use this company resourcefully. Bought this watch for my sons 15th birthday and he is absolutely over the moon with it . Photos dont do it justice so much nocer to look at when its in fron of you. This watch is beautiful, it looks perfect and can be worn in the day and night. A very classy watch for a man. Great item. My husband had to have a link taken out but now It fits really well and very comfortable. \r\nThe front colour is nice and shiny. I was worried the colour would be duller then the picture but its not. \r\nIt feels sturdy and durable. Definitely worth the money. \r\nMy husband struggled at first to work out how to set the date as it kept changing to a new date every few hours, then he worked out you pull the pin out to a different point to be able to change the date and pull the pin to a different point to change the time. This is probably written in the insurrections but of course he didnt read them. Was very simple once we knew how. \r\nVery happy. Great watch. Partner loved it for his Christmas present . Brilliant watch. Comfortable and looks very professional. Easy to remove links. Brought an extra one in black for a Christmas present. Great watch, the blue face looks even better in real life in my opinion. Had to get a few links removed but no problem. Bought for my son for Christmas and am really pleased with the look of the watch, much nicer than the online picture which is always a good surprise. Also the watch arrived very quickly. The watch itself is beautiful, it looks even better in person than it does in the pictures. It has a nice weight to it, and feels substantial and solid, but is light enough for comfortable wear. The blue colour on the face is gorgeous, and the light hits off the facets of it subtly, but just enough to draw your attention. The actual brand packaging on the watch is amazing too, it really looks and feels like the premium piece it is. Very excited to gift it to my partner this Christmas. I am over the moon with my purchase. The ordering process through the watch shop is fantastic and the watch was delivered extremely fast. When it arrived I was not disappointed and the watch was exactly like the picture. My partner who it is for had additional links removed at our local jeweller very easily and feels the watch is comfy to wear. It opens and fastens simply but also feels secure when wearing it. Would highly recommend. This is a beautiful watch which I bought as a present for my husband on the day of our wedding last Saturday 8th April. It is very smart and stylish. In addition, the watch shop was the cheapest place I could find the watch my a considerable amount. I got this watch as my birthday present and since then I never took it off. Its great because of the look which is really smart. I would record this watch. Was the perfect gift for my close friend, he loved it !! Quality of the watch was amazing !! Great service & very fast delivery, Would recommend to anyone! £61 cheaper than a high street retailer advertises it for. Agree with others who have said the pictures dont do it justice, looks better in reality. Note: The main picture shows to me anyway!! that the larger links are a darker colour to the outer ones? This is not the case. Its that these are a brushed stainless as opposed to the outer ones which are a polished type. Very pleased. 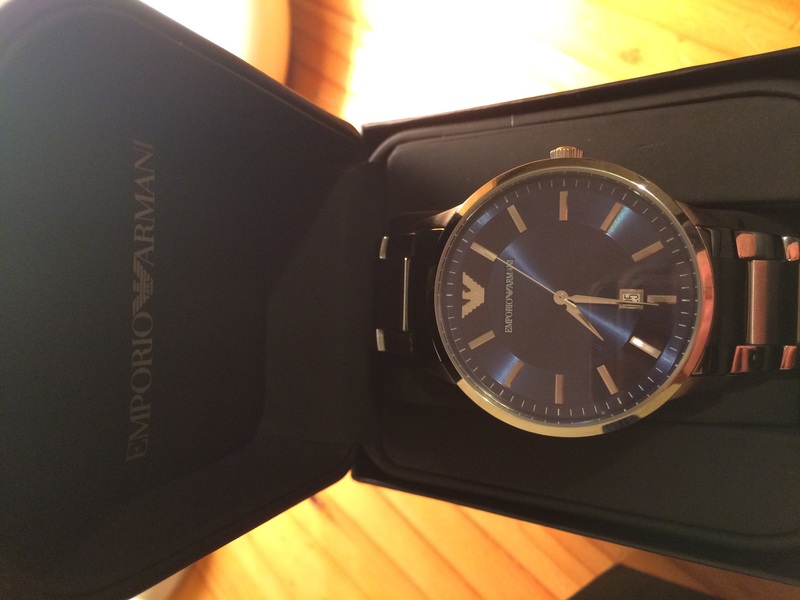 I bought an Emporio Armani watch 9 years ago, which is still going well today. So as far as reliability goes, Id like to think my latest purchase will be at least as good. As an aside, I ordered the watch before 2pm yesterday and received it at approx. 9am this morning. Fantastic. Beautiful watch. Absolutely delighted with it as is my son. Very prompt delivery by WatchShop and the packaging was very well-secured. 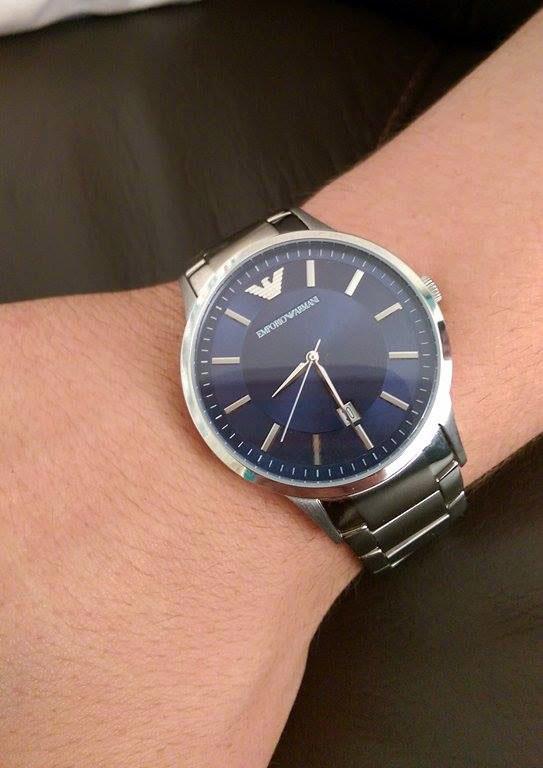 We all know that Armani is an excellent brand, so theres not much to say about the watch itself. I have not used WatchShop before but will definitely come back for more! An outstanding service I must say, no doubt about that. I purchased this as a gift for my sons 18th birthday. He loves it! This watch is simply classy. I was instantly drawn to the stunning colour of the face, and the strap is very fresh looking, not chunky like most others. We were grateful for the strap adjustment service that was offered at time of ordering too. This enabled my son to wear his gift straight away! Excellent value for money. Next day delivery too...very impressed with the range of services provided. Fast delivery. Was bought as a present for my son and he loves it. Very stylish, nice looking watch. 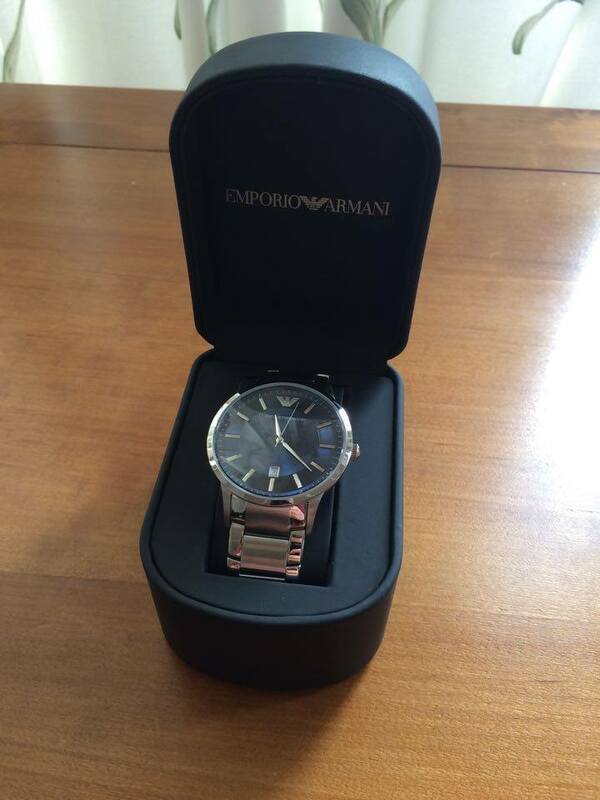 This is a beautiful watch which was bought as a gift for my grandsons 18th birthday. It was very nicely gift wrapped. The product I purchased was exactly as I imagined it to be, stylish, not too big, not too small, perfect for my needs! I fell in love with the watch as soon as I saw it online and everywhere I go people always ask about it and how much as it does look expensive but isnt that expensive at all! definitely one of my best purchases would recommend too anybody! Lovely watch. Simple but elegant design. I bought this watch for my boyfriends birthday. It came well-sealed in its packaging and the presentation was nice. The watch came with a handbook and two extra links to add to the watch in case the watch was too small, which was well thought of. The watch looks great on his wrist and suits him well. The size of the watch is great, I was worried it would look to large on the wrist but it does not. Theres nothing I dont like about the watch, it was one my boyfriend picked out and I am happy with. We brought this watch a a gift for my son as he was my best man at my wedding. He was over the moon with the watch. It looks very stylish, fits comfortably and stands out. Great purchase and great service with the next day delivery. The watch was bought as a graduation present and it is the first time I have purchased from Watchshop, but it wont be the last. I ordered the watch on a Thursday evening, which in itself took some deliberation due to the widespread choice. The site is so easy to use and gives you all the information you need to make an informed choice. I payed a few pounds extra for the express delivery and it arrived on time, only a day and a half later. We were reluctant to use the internet for such a personal and valuable piece but am nothing but impressed with the service I received. Excellent watch,lovely quality,very pleased with the purchase. 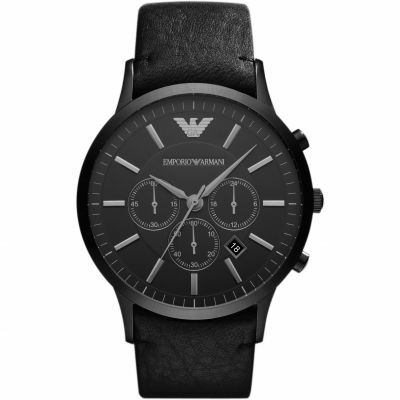 I bought this watch for my 15 year old son, we have found it hard this year and my son said he didnt want anything for Christmas, but I know this was the watch he wanted. I really liked the watch too, the price was reasonable and I thought even if he only had one thing to open then this was it. 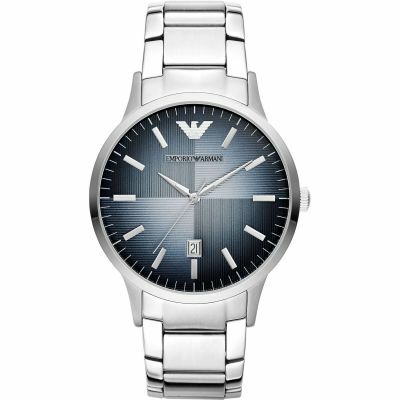 The watch has a lovely blue metallic face, with date function and stainless steel strap. Just the thing for the right young man to look stylish. My son loves Giorgio Armani, and bringing this line out makes it more affordable for that younger buyer. Thank you from a mother who wants to give an extra special gift for her son. Great site no complaints, Delivery was very quick and price was very good too. Lovely watch \r\nGood service came on time as its says. Excellent service! Fantastic watch at a great price. Super quick delivery and well packaged. Will not buy a watch from anywhere else now. Brilliant service & watch. Classy buy. watch is perfect the blue screen is just the right colour for the watch i love it and the service was brilliant aswell! This watch was a gift for my friend, he thought it was amazing! I am really happy he loves it! I havent wore a watch for a number of years, however recently i got a strong inclination to buy a really nice one, i knew the kind of thing I was looking for, and came to WATCHSHOP to see whether i could find it. 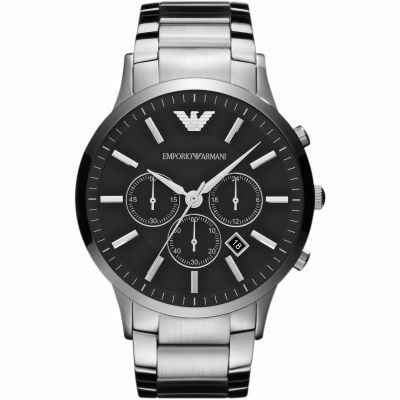 WATCHSHOP has a massive variety and the choice is unparalleled, i quickly came across this Armani watch and thought it looked fantastic. After doing a bit of research on the internet I decided this was the watch for me.\r\n\r\nThe watch arrived very quickly, as promised, and was in perfect condition, on the invoice it is clear that the watch is checked re: a number of criteria at every stage of the order process. I was kept informed throughout and the watch is absolutely beautiful in every way. Actually the watch looks better in reality than on the picture!\r\n\r\nAll in all, a stunning watch, excellent customer service and a great price what more could you ask for? Order was delivered to store next day and strap was adjusted for free. Great service and lovely watch. Good solid watch. Nice face colour. My son was very pleased with this watch. The blue face really makes it stand out and its the first thing people see. It wasnt reduced to fit which I asked for with my order but I was able to have it reduced and it only cost a couple of pounds. Very good watch, prestige condition. Bought it to wear at my wedding, very impressed! I am very happy indeed with my purchase. my son is delighted with his 21st birthday gift. Gorgeous watch . . My husband loved it!! Brilliant Watch, great value for price, bought as a present. Brilliant service and at a much reduced price . Loved this watch an bought it for my husband on our wedding anniversary.wanted him to have this watch,as Ioved the modern contemporary design,an the unusual blue face.goe the watch very quickly an without fuss,then took it to have a lovely inscription put on.He adores it an Ive since ordered a friend a watch from you,as very impressed with watch shopfor the best. Nice fit, delivery was great. Stylish watch. Would recommend! Good service,fast delivery and great quality product. My husband loved his birthday present. It looks really stylish. Fantastic watch. This isnt the first Armarni watch I have purchased, I bought this watch as a present for my Grandfathers 75th Birthday. The watch is quite heavy which makes it feel sturdy and well made. i was wearing this watch occasionally but now the crown of the watch came off and it is not working at all. Not happy at all. This is an elegant and well made watch. The face is simple and clean making it easy to tell the time at a glance. The watch is light and compact. The strap is attractive and well made albeit as it clasps into the middle from both sides - I find it a bit tricky to do up but am developing a technique. I love the look of this watch and am really pleased I bought this product. 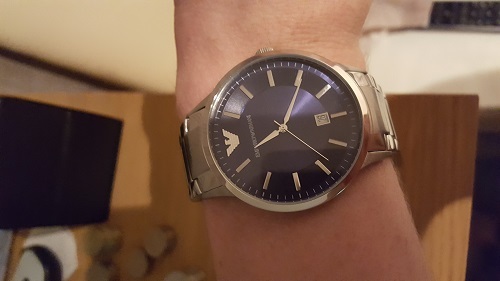 Beautiful watch for my husbands birthday, excellent service and easy to use webside - also managed to get a discount code which saved me another 6% thanks !! Lovely watch for my partner, well packaged and quick delivery, Thank you. Great watch. Classic look. Bought for son as a birthday present. He loves it. It is very nice and i like it. I have brought this as a wedding present for my husband to be and was not dissapointed. It really is a stunning watch, the quality is of a high standard. I would highly recommend buying it. The packaging is gorgeous too which is ideal if you are buying it as a gift. Many thanks to watchshop for the super fast delivery too! Fantastic watch great for any age. Delivery was superb. Would recommend this watch. The watch was just what my Son wanted, he loves it. Great service, speedy delivery and a great price. Couldnt have hoped for a better watch. It came very well packaged and the watch itself is very nice and looks very smart! The face is nice and large, with a lovely blue tint and just looks great! Bought as birthday present for son, he loves it, delivery really fast, cant recommend enough. Nice solid watch, large face, chose the blue face, nothing dislike about it. 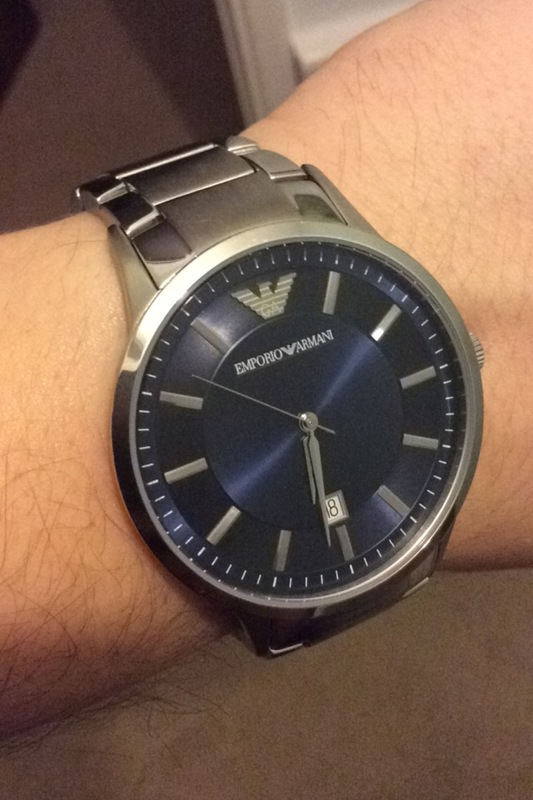 Love this watch, very classy, very slim, nice big blue face, and shiny strap ! I wanted something a bit slimmer and smarter than what I normally wear and this fits the bill ! For the price I paid its a bargain ! Would defo recommend, good service, delivered to shop and had it adjusted when I picked it up ! Professional service, will use again . Great Watch for the Price. The build quality is better than previous watches Ive owned in the same price range. Like the professional yet subtle appearance. Time easy to read. Struggled to find a watch that suits my small wrists but this one fits this criteria nicely. Lovely looking watch , Christmas present for my son who loves it. Had some links removed before delivery but needed one more removed which was done for free. Delivery was on time and packaging good. Would definitely recommend watch shop and this watch. Excellent watch for the price, dont second thought it! 5/5 Only problem was i had to remove links myself but i think theres an option for it, must have missed it! beautiful watch the blue face is perfect again the steel bracelet strap. Cool, modern and stylish by a well known and trusted brand. Fast Delivery, watch as described, Happy with product. Overall look, better than the picture not that it looks bad online. Love the fitting as a bought it for my dad as a present and he feels comfortable in it. Bought this watch at a great price with 10% Black Friday discount, went into town to find it was £82 more expensive from store jeweller so was really pleased. Was worried of size of face prior to arrival and seeing in stores as my partner had been browsing watches with this face colour online, but looks great value for money and is of course a great brand. My sister and I also halved in for another watch as a gift, again, really good price and was an new style that was not that common from the brand itself. Absolutely love this watch, very good quality, very smart. I was very pleased with the product it arrive very quickly, in time for Christmas as this is a christmas present for my son. Ordered watch Friday evening , even at busy time received promptly , and already sized to fit . Watch looks great ! Casual yet smart too ., really pleased with it and the service from watch shop generally . ps you forgot to put in the spare 2 links this time though.. I would.,, and do recommend watch shop to friends and family . Bought as a birthday present for my dad, looks really smart and professional, great gift! My Husband lived his Watch and the Watch Shop where so help full when I had a problem putting through my order on line. The delivery was the next day as promised. I will always buy from the watch shop again thank you so much. Fantastic services. Fast delivery and very pleased with the product. This watch is perfect for the price! A lovely shade of blue, its just what i was looking for, for my boyfriend. 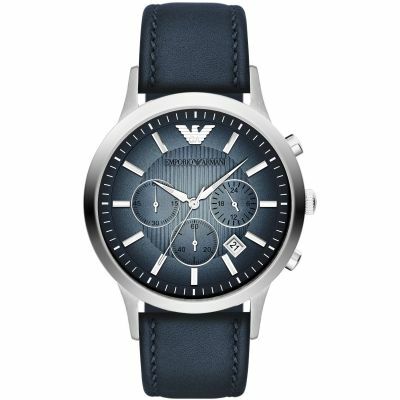 I bought this watch for my 17 year old son, he loves it beatiful watch. Very pleased with this purchase. The watch has a minimalist design and is very stylish and smart, making it great for any occasion. The dial is a lovely dark blue colour and is very easy to read with the date displayed as well. The bracelet easily adjusted and secured. Would definitely recommend this product. 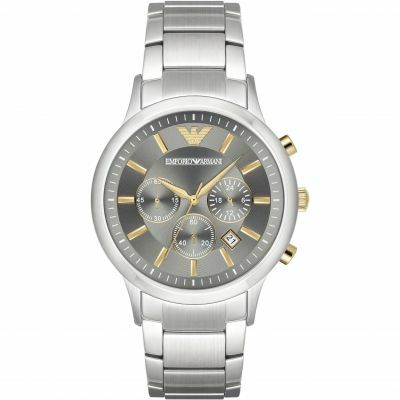 Bought this fo my partners Christmas its a lovely watch with a nice good sized face Im sure my partner will love it! This is a great watch. Classical style not too blingy. Just right with a nice suit. Love it! I knew I wanted a watch with a blue face for my boyfriend and it was very easy to find the perfect one. This watch looks stunning and classy. The blue is beautiful shade and the whole face is simple and not overcomplicated. The bracelet isnt too thick and clunky like some watches and the watch part itself is slimmer than most so it fits slim on the wrist. Im really happy with this purchase and my boyfriend was delighted with it. This watch is truly amazing. My boyfriend was very happy with this gift. Would recommend this for its striking blue face. Beautiful watch, amazing price and delivery. Very nice watch. Like the blue face. Bought as a gift, great quality good looking watch. Receipient was thrilled with their gift. Really stylish watch, meets all expectations and great value. Just hope my son like his 18th birthday gift! Bought for my grandsons 18th birthday. He hasnt seen it yet but I am sure he will love it. Excellent quality and superb service and delivery. Brilliant watch looks lovely. Really nice blue face and silver bracelet smashing combo. Love it! A beautiful timepiece it shines elegantly in the light. The bracket and dial are stunning and attract the attention of everyone. Definitely reccomend to anyone who is fortunate enough to purchase. Gorgeous, stylish watch. Looks very classy on. Been looking for something like this for a while, not sporty but more dressy. The dial is a lovely blue colour and the watch itself is quite heavy weight. Very happy with purchase. The product was great and the quality was what I expected as the advert accurately represented the item. The watch seemed great value online but was only £20 cheaper the high street full price, so it could be purchased at the same price during sale times with also saving cost for having a link removed. This watch is very stylish and has a great look to it. The blue face colour stands out against the silver and gives it a stylish edge. The face is nice and big and the size goes well with the chunky links. I had seen this watch elsewhere and you was the best price I came accross, excellent delivery, also having the option to re-size the strap was excellent. Its one of many of Armarni design watches but this one is of very simple design if you do not want anything too fussy, also the blue face looks lovely and makes a change . The face of the watch is also a good size. Would highly recommend my partner loves it. Nice fittings since you can let them know about your measurements. My son has not wanted a watch until he saw this one! The blue face and silver strap were ideal. It is stylish but not over fussy, simple design without all the other small dials complicating its stylish simplicity. My 15 year old son loves it and wears it with pride. I bought this watch as a graduation gift for my son and I must say the watch looked stunning on the photos but didnt compare to seeing the real thing. The face is larger than I thought it would be but for me that only added to it. The blue face against the strap is striking. The strap itself is not bulky as some can be. I think my son will have this watch for many years to come. Item came perfectly wrapped which is always reassuring. 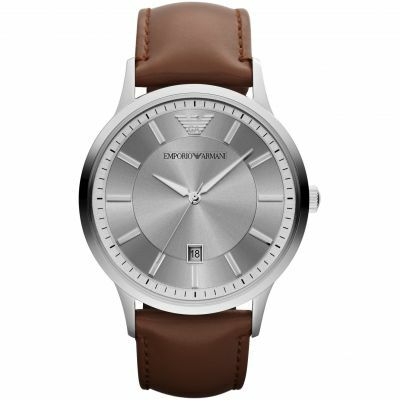 A beautiful face which is eye catching & is immediately obviously an Armani watch which is the objective of buying one.easy to operate. Love it. Bought this watch for my husband. Hope he will like this one, couse I do. : really good price. Fast and safe delivery. Will order from you again. Beautiful product, nice large and minimalist style. Be prepared to get a few links removed though, theyre on the larger side. Jeweller I took it to didnt question the authenticity. This watch is truly amazing. At first I really wanted the blacked- faces version but now after going for the blue one, Im so glad I chose to, the blue face is very attractive and catches all angles of light perfectly! I have had mk problems with the watch, so far, and I doubt I will! Product came in high quality boxes! Many of my friends think its the nicest watch theyve ever seen! High recommend! When it came it was very big on me, however I took it to a local jeweller and it cost only £6.50 to remove 5 links- and now it fits great!! The watch is beautiful. Its very stylish and sleek. The watch face size is big but not too big. The blue on the face is a lovely shade. I cant wait to give to my husband to be on the morning of our wedding. Very pleased with my stylish new watch. Highly recommended. The face is large and clear and there are none of the unwanted gimmicks! I like the weight of the watch and how it feels on my wrist, I like the design of the watch, I like the contrasting colour of blue and sliver. I have never had a quality watch before. Most expensive one was 30 quid. I looked forward to receiving my watch and when I received it I wasnt disappointed. 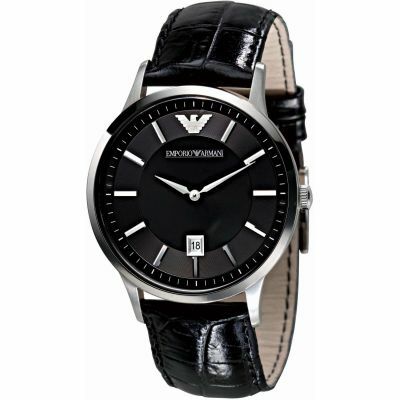 It is truly a classy looking watch, the minimalist face with the unmistakable Emporio Armani motif is very striking. I certainly wont go back to cheap throw away watches anymore. Even the bracelet oozes class. A beautiful relatively inexpensive timepiece to cherish. Great looking watch. Even better than the pictures. Nice on your wrist and worth the money. Very impressed with the quality for the price paid. Wouldnt hesitate to use this site again. 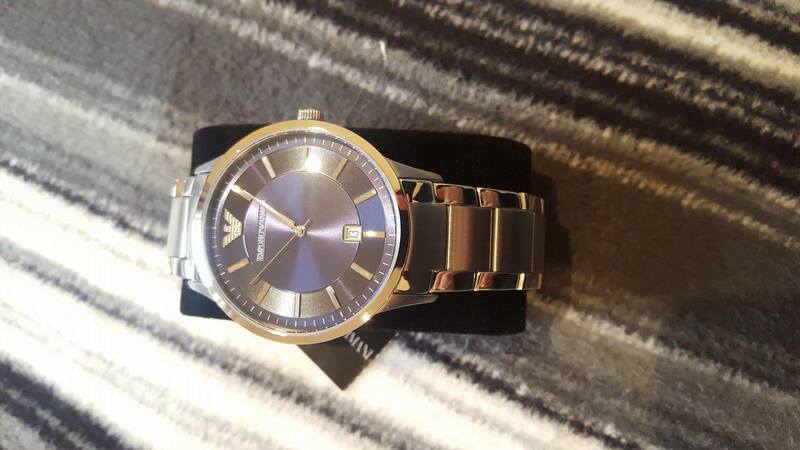 I bought this watch as a suprise birthday present for my boyfriend, he absolutely loves it, it looks lovely, its very comfortable and stylish and very good value for money. I was very please with this product because its cheap for what it actually looks like.id recommend you to buy it!!! Im really pleased with this item. I have bought it as a gift for my partner for Valentines Day so I cant comment on fit etc. but I was very pleased that it arrived in a stunning Armani Box within a box! and it looks just perfect. It is very easy to set the time and it looks just stunning. I was really pleased with the price, having seen it elsewhere for more money and I love that my partner will be able to take it into a store to have it adjusted. I know I could have sent his wrist measurement and had it adjusted before hand but measuring his wrist in his sleep seemed a bit odd! The watch is very elegant and good to wear. The blue colour makes it look very nice and stand out, the links are very appealing. the watch I purchased for myself was incredible, when I first received the watch it was far too big, but the instruction booklet was very informative and talked you through step by step, on how to remove links, the watch now fits perfectly! The stainless steel strap is nicely waited and is crafted to a high quality! The blue face of the watch is also amazing, the pictures simply do not do it justice! If I were to look at one down side, it would be that, there are no lights or glow in the dark paint meaning it is difficult to read in the dark but aside from this, it is incredible!! Defiantly worth the purchase! The watch is really well made. My son was really happy with it,he was a happy lad Christmas. Would definitely order again off watch shop . Really pleased with the watch. Excellent quality for the price, watch face has a stunning colour. Bought for son, who is delighted with it. 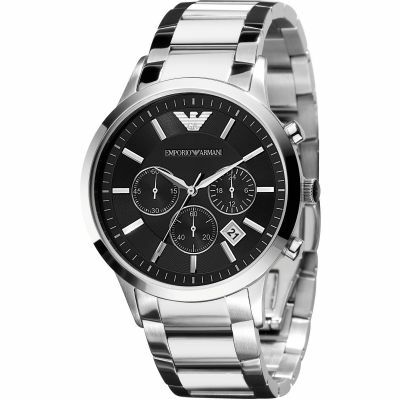 A beautiful and elegant, simple watch design by Emporio Armani. Build quality as expected for a great price. The dark blue face complements the chrome surround, arms and strap perfectly. A top class timepiece from a top class label. I really like the watch. It definitely looks better on than online. It has a large face and it was easy although does cost, to get it altered to fit your wrist. The colour is good and it is larger than appears online. I brought this item for my boyfriends christmas present and he loved it! I have never brought from the watchshop before and was a little dubious however the watch came in excellent condition and next day recorded delivery too which put my mind at rest. I would recommend any one to buy this item. I bought this watch for my husband as a Christmas present. I cant wait to give it to him as it very classy looking and I know he will be thrilled to bits with it. It is very stylish and good value for money. I can recommend this watch if someone is looking for something special for someone special. Havent seen it yet as was a xmas gift for my husband but i asked for it to be gift wrapped and i wasnt dissapointed it looks lovely the watch arrived next day and was impressed with the speed at which it arrived .very pleased so far with watch shop will def buy from you again . Item was brought as a present for my husband. He was very pleased with the watch! Watch delivery was super quick aswell. I bought this watch for my 22 year old Son for Christmas. He has already seen it and absolutely loves it. It looks even better than it does on the website. The watch face is a lovely blue and not gaudy. The slim design makes the watch very classy and would be really suitable to wear at a wedding or interview but also looks good with casual wear. The watch was bought as a present for my son so the workings of it are not yet known. He has a very good eye for grown up good looking quality watches. The watch looks and feels very impressive and of excellent quality. The strap appears to be very substantial and is adjustable to give a perfect fit. The dial looks very stylish, is fashionable and easy to read. Overall, I am very impressed with the quality and look of the watch. Very good service, great product, looking to buy my next watch from here as a gift. excellent item, fantastic color, fast delivery. everything great!! !a wonderful gift for my husband. Fantastic watch. Had lots of compliments from friends and family. Saved £40 buying it online instead of in store. Will definitely be buying from watch shop again. Great customer service. Very smart design, the watch face is stunning. I would recommend this watch to anyone looking to add a touch of class to a casual everyday lifestyle! I an very satisfied with this product !! I have been patiently waiting to make my savings reach to a point where i can finally buy this item...and i have no regrets spending the money i did to purchase it. This watch with its blue face has caught the eye of many of my family/friends and colleagues which goes to show its an eye catching product and they gave positive reviews..i must admit that the highlight and what i liked most about the watch is its blue face because the colour is spot on, it complements the silver wrist chain. Writing this review i have tried to think of faults but its hard to! The only problem i had was the chain of the watch was big but i took the watch to Goldmiths who work in conjunction with watchshop and tightened it for free...overall i am a very happy customer! Bought the watch as a birthday gift and my husband loved it! the watch was ideal and it arrived very quickly . Am very pleased with the service and product. Brilliant watch, looks exactly like the photos. Nice two tone silver and dark blue face. The face is a bit bigger than expected but still doesnt look clumpy. The Product was perfect as expected. Delivery was exceptional. Earlier than I thought. All in all, one of the best buys this year Definitely recommend this. The watch is great, nice smooth classy and edgy look to it. Perfect for work and casual occasion. Cant go wrong. I was on the look-out for a new watch and had something very specific in mind: I wanted something that was stylish but not bling. Normally watches by designer brands like this look gaudy just my tastes/opinion, of course!, but this one caught my eye because it was just shiny enough without being overbearing. It also has a rather thin profile and enough weight to it to make it feel really good on I spend my days typing, so watches that are too heavy are cumbersome -- this was just right. My boss even saw it and joked that they must be paying me too much! If it ever broke I wouldnt hesitate to get another. 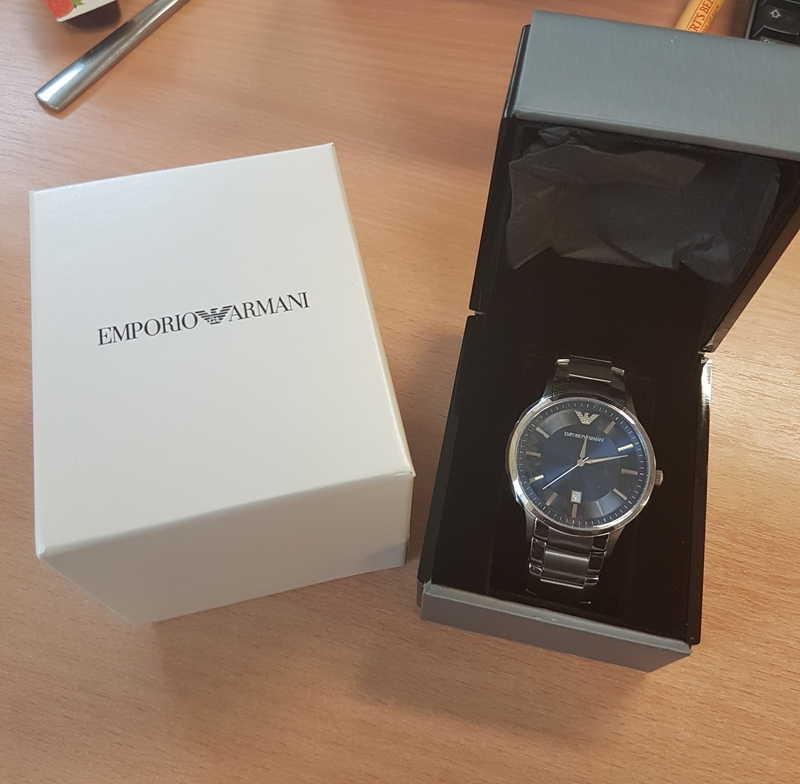 I ordered this watch for my boyfriends birthday - its not for another couple of weeks so I cant tell you what he thought of it yet, but I think it is lovely. Very sleek, slim and classic which is good as he does quite a physical job and a chunkier watch would get bashed around a lot. I think I will have to get a couple of links taken out as the strap is quite large, but this is probably a good thing as it means this will fit lots of different men - or if he puts on a lot of weight in the future!! i like the service from them t contact them on email as i was little bit worried about the delivery but atlast it was perfect timimg . I bought this as a gift for my partner and he loves it. his very words simple and elegant. Bought this watch for my sons 21st. He was delighted with the face colour and how light weight it was. Well worth the money. Really love the watch, excellent quality. Nothing I could fault on it. A stunning looking watch. The blue face is very striking. Its modern and slim line. Very good quality. And the name says its all............... ARMANI simply the best! Was greatly admired by all and a fantastic birthday gift. Very satisfied and happy with this purchase. There is nothing I dont like about it. Brilliant delivery and very thorough. The watch is amazing and looks fly. If you want to to look fly and very smart buy this watch.